A bar chart shows a stock's opening, high, low and closing prices. A stock bar chart is one of several types that investors use to visually analyze stock prices. A bar chart consists of a horizontal series of vertical lines, or bars, that each show a stock’s range of prices for a certain time period. Bar charts are widely available for almost any stock on financial websites or in your broker’s trading software. With a quick glance at a bar chart, you can see how a stock’s price has recently behaved and spot any potential price patterns. Identify the time period on the chart that each bar represents. This is typically shown near the top of the chart next to the stock’s ticker symbol. A bar chart might use a daily time period, a weekly period or some other interval. For example, if a bar chart has a daily time frame, each bar represents one trading day. Pick a bar on the chart to analyze. Identify the date or time directly below it on the chart’s horizontal axis, on which dates and times progress from left to right. This represents the specific trading day or time during which the bar’s price points occurred. In this example, if a bar is directly above July 10, its price points occurred on that date. Identify the highest and lowest points on the bar. Find the respective prices on the vertical, right axis with which these points align. These prices represent the highest and lowest prices that the stock reached during that time period. In this example, if the bar’s highest point aligns with $25 and its lowest point matches up with $23, the stock hit a high of $25 and a low of $23 on July 10. Identify the short, horizontal line that extends to the left of the bar, and find the price with which it aligns on the price axis. This represents the stock’s opening price at the beginning of the time period. 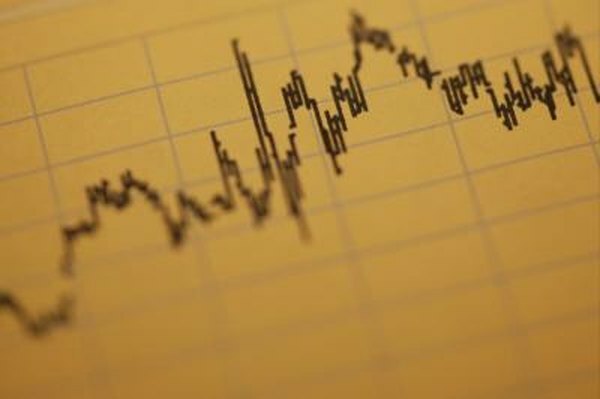 On a weekly chart, the opening price occurs when trading begins on Monday. In this example, if the line matches up with $23.50, the stock opened at $23.50 on July 10. Find the horizontal line that extends to the right of the bar, and identify its price. This represents the stock’s closing price for the period. On a weekly chart, this price occurs when trading ends on Friday. In this example, assume the line matches up with $25. This means the stock closed at $25 on July 10, the same as its high for the day. Because the closing price was higher than the opening price and at the top of the range, this suggests that investors grew optimistic on the stock during the day. Locate a series of consecutive bars on the chart in which the highs and lows increase from left to right. This indicates an upward price trend. Alternatively, find a series in which the highs and lows decrease. This signals a downward trend. For example, if a stock reaches consecutive highs of $25, $26 and $27 and consecutive lows of $23, $24 and $25, respectively, prices are trending higher. Some bar charts omit the opening price on each bar and include only the high, low and close.